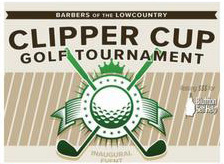 September 22: Barbers of the Lowcountry has your tee time set for the inaugural Clipper Cup Golf Tournament, held at the Crescent Pointe Golf Club, an Arnold Palmer “Signature Course.” Registration and putting challenge begin at 11 a.m. with 1 p.m. shotgun start. The format is a four-person scramble with 18 holes. Please don’t stack your team with four ringers (and don’t be a sand-bagger either). The entry fee is $100 per player and includes green fee, cart fee, dinner by One Hot Mama’s following the tournament and a free haircut! The tournament benefits Bluffton Self Help. We are looking for sponsors of the event, [email protected] or barbersofthelowcountry.com.